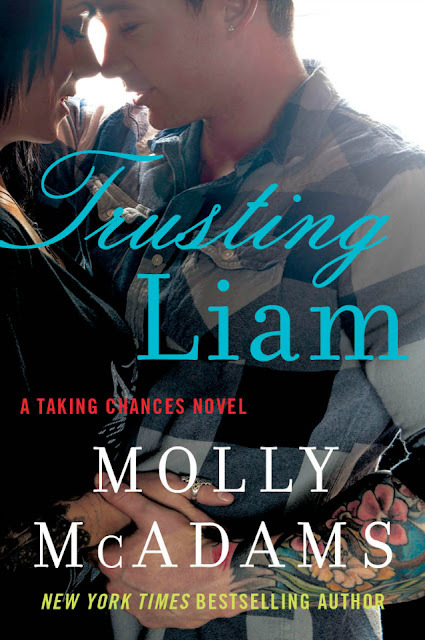 First off I have to say I was so excited when Molly said Liam was getting a book. Taking Chances/Stealing Harper is one of my favorite books/series, EVER! No matter how much they broke my heart I have read them multiple times. It is great that we get to see & hear from the characters that I grew to love! You also get characters from the Forgiving Lies series. You really need to read both series to understand Trusting Liam. I can’t say enough how much I loved this book. Liam is the best of Chase and Brandon. The bond between Liam and Brandon is amazing. Brandon is his father but also his best friend. You don’t see a lot of interaction with Harper & Liam, just a few lines here and there. But that was ok with me. It’s Liam story. Brian is one of my favorite characters in this book, for sure! If you don’t remember Brian he is the tattoo artist that worked with Chase. His advice is so meaningful and will bring you to tears a few times but will also have you laughing out loud! Oh the memories! There are a few in the book and will have you reliving the love you have for Chase. I found myself shedding some tears a few times. Especially when you find out the meaning behind one of Liam’s tattoos. Kennedy has some tough walls built up and for a good reason! She has a hard time fighting her feelings for Liam. But she has a few secrets she is keeping tucked away. When one secret comes knocking on her door how will she handle the situation? It would have never been a question for me how to handle it!! But she finally comes to her senses with the help of Brian. Overall, I feel that Molly gave a great look into the life of Liam. The epilogue tied everything up in a nice bow along with a few more tears. You’ll understand when you get there. I had high expectations for this book and I think she delivered on most of them. This review was prepared by guest reviewer, Chrissy Rhem. An ARC was provided in exchange for an honest review. "Trying not to wake him, I slowly slid out from under his arm and off the bed to search for my clothes. Once I was dressed, I told myself to just leave, but I couldn’t help it—I turned to look at him in the light. I needed to be sure I hadn’t made him up. I’d already made a mistake with him. Drunken one-night stands weren’t my thing. Drunken one-night stands with strangers in Vegas were even worse. Molly McAdams grew up in California but now lives in the oh-so-amazing state of Texas with her husband and furry four-legged daughters. Her hobbies include hiking, snowboarding, traveling and long walks on the beach, which roughly translates to being a homebody with her hubby and dishing out movie quotes. When she's not at work, she can be found hiding out in her bedroom surrounded by her laptop, cell, Kindle and fighting over the TV remote. She has a weakness for crude- humored movies, fried pickles and loves curling up in a fluffy comforter during a thunderstorm...or under one in a bathtub if there are tornados. That way she can pretend they aren't really happening.